We’re delighted to announce that we have been shortlisted for two awards in the 2018 SME Cambridgeshire Business Awards. 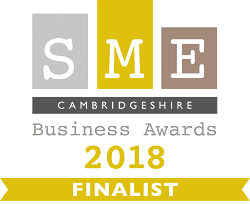 We have successfully reached the finals for not one, but two categories in the 2018 SME Cambridgeshire Business Awards. Reaching the finals of the awards appropriately reflects hard work, enterprise and endeavour in business. We’ve been shortlisted for the Business of the Year more than 50 Employees and the Service Excellence awards. The competition was fierce across all categories; the quality and quantity of entries were at a record high, so to make it to the final, businesses had to stand out. The categories that we were shortlisted for were certainly no exception, with us having to provide solid evidence to support our entries. Mark Noakes, Director at Aston Shaw said: “We were delighted to learn that we have been nominated for these awards, especially awards that represent the areas of our business we’re most proud of. The fact that we’ve reached the final is a culmination of all our efforts across the company, but particularly the hard work of our Cambridge team”. We are also sponsors of the Best New Business Category, a category specifically chosen by the firm because we pride ourselves on getting new businesses across East Anglia off the ground by providing them with startup advice which includes, but goes far beyond, how to set up their accounts and how to take advantage of business loans and grants. The glitzy awards ceremony will be held on the evening of Wednesday 13th June 2018 at Newmarket Racecourse.